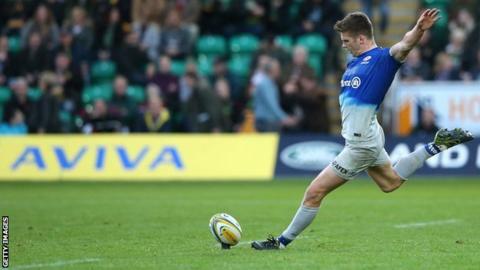 England fly-half Owen Farrell kicked all of Saracens' points as they beat Northampton at Franklin's Gardens. Saints, who topped last season's Premiership table and were boosted by the return of Wales wing George North, went ahead with Stephen Myler's kick. But Farrell twice landed penalties to give Sarries a 6-3 half-time lead. In a match dominated by breakdown battles and kicking for territory, two more Farrell penalties after the break secured victory for the 2015 champions. With the exception of new Northampton arrival Victor Matfield, both teams were back to their full complement of World Cup stars for this repeat of the 2014 Premiership final. But it did not make for a game of flowing rugby, as neither backline were able to make a serious impression in a try-less encounter. The Saints' scrum started the better and set the platform for Myler to kick them ahead inside the opening two minutes. But four Farrell penalties put Saracens in command - and the winning margin may have been even greater had United States wing Chris Wyles not spilled the ball with the try-line at his mercy. Victory for Mark McCall's side keeps them top of the table with a 100% record, but Northampton, already beaten by Worcester and Sale this season, have now lost three of their opening four matches to leave them down in ninth. "We are not a long way off. I know we have had a disappointing start, but we are not going to be pressing the panic button. "We know what we need to do, and we can get better. "You have got to be really accurate when you play Saracens and you have to take your opportunities." "It was a brilliant away performance; we ended up dominating the game and controlled the last 25 minutes. "We defended magnificently and I am chuffed to bits we got the win. "It probably wasn't the best advert for the Premiership but that is the way the game went and our job was to make sure we won." Northampton Saints: Foden; Elliott, G Pisi, Burrell, North; Myler, Fotuali'i; Waller, Hartley, Brookes, Craig, Day, Gibson, Wood (capt), Dickinson. Replacements: Haywood, Waller, Hill, Patterson, Harrison, Dickson, Hanrahan, Tuala. Saracens: Goode; Ashton, Taylor, Barritt, Wyles; Farrell, Wigglesworth; M. Vunipola, Brits, Du Plessis, Kruis, Hargreaves (capt), Itoje, Burger, B. Vunipola. Replacements: George, Barrington, Figallo, Rhodes, Brown, Spencer, Hodgson, Bosch.